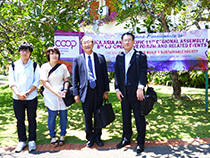 On September 16-20, 2014 the ICA Asia Pacific 11th Regional Assembly and the University/Campus Co-op Committee (Chairperson: Prof. Shoji) was held in Bali, Indonesia. Around 310 participants from 20 Asian countries attended the Regional Assembly. There were 7 participants (including 2 students) from NFUCA. Initiatives by co-ops from various countries were introduced in the Regional Assembly, Co-operative Forum and ICA-AP University/Campus Co-operative Meeting. In addition, students and co-op staff were able to interact during visits to the local university and high school. On September 17th, the 6th University/Campus Co-operative Committee Meeting was held. The Committee has 8 member countries (India, Indonesia, Japan, Malaysia, Pakistan, Singapore, South Korea and Thailand) and 7 member countries attended the meeting. The Committee decided that the next regional event (workshop) would be held in Thailand next year. An election for Chairperson and Vice Chairpersons of the Committee was carried out (once every two years). Prof. Furuta from NFUCA was elected as the Chairperson, while Prof. Jo (KUCF) and Dr. Azlan (ANGKASA) were elected as the Chairpersons. 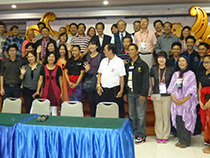 The 8th Co-operative Forum was held on September 18th and the Regional Assembly on September 19th. Apart from these events, the Committee conducted a half-day seminar in Udayana University. Each university/student co-op delegation presented their activities, discussed about themes allocated for each group, and then each group made a presentation about the discussion results. From NFUCA, the Student Committee Chairperson, Yoshioka, presented about the activities of Student Committee in Japan. The theme of the 8th Co-operative Forum was “Co-operatives Build a Sustainable Society.” After setting Millennium Development Goals (MDGs), the United Nations is now working on the proposal of Sustainable Development Goals. The Co-operative Forum discussed how co-operatives should be involved in this initiative. The Keynote Speech at the Co-operative Forum entitled “Role of Co-operatives in Sustainable Development of Local Communities,” followed by two sessions: “Evidences of Sustainable Socio-Economic Environmental Growth through Co-operatives in the Region” and “Role of Data, Research and Innovation in Sustainable Development.” After these sessions, panel discussion and open forum was held. On September 18th, 2014, the members of ICA-AP University/Campus Co-operative Committee, mainly students, visited Udayana University Student Co-operative and participated in a half-day seminar and exchange among students. Employees’ co-op and student co-op exist in Udayana University. Students handle the operation of co-op themselves. One of the students said, “We operate this student co-op because we want to work as managers of co-op in the future.” These words were impressive and showed the varying thoughts and relations of students with co-op. In the half-day seminar, students presented the profile and activities of their co-ops. For example, delegation from Philippines conveyed about their initiative of a leadership seminar for students on alternative energy and environmental problem, and delegation from Indonesia presented about a contest to deepen the value of co-op among students. These initiatives differ from one country to another, proving the diversity and uniqueness of each country’s co-operative movement.